Today our whole day and existence is governed, regulated and controlled by the date and time. Where & when we need to be is timed down to the minute. We have no trouble knowing the date and time at any minute of the day. The concept of not knowing what the exact time of the year it is is alien to us. And yet this wasn’t always the case. Until the advent of writing why know the exact date. You only need to know enough to know when to plant & when to harvest your crops. The introduction of writing is intimately linked with the keeping of records. Important among these, in many societies, are records of events – moments of great significance for the community or its leaders, of the kind to be inscribed on monuments. But commemorating the event itself is not sufficient. There is a desire to tell posterity when it happened. This involves naming a year, and placing it within a recognizable sequence of other years. An Italian monk, Dionysius Exiguus, was commissioned by the pope in AD 525 to work out a Christian chronology, principly so that it could be used to compute the date of Easter. Using earlier tables, he concluded that Jesus Christ was born in the Roman year 753 AUC (see ‘Other Chronology systems’ below). He therefore proposed that the Christian era begins at the start of the following year. 1 January 754 AUC became 1 January AD 1. You will notice that there is no year 0. From other sources of evidence it has become clear that Jesus must have been born before 4 BC – the date of the death of Herod, from whose massacre the infant Jesus escaped. But this does not make the new chronology any less useful for dating subsequent events, once the chronology is widely used (a process which takes some time to achieve) you have a firm framework. When was it Adopted ? Although the dating system was devised in 525, it wasn’t widely used until after 800,and even after that, other systems were still widely used throughout Europe. 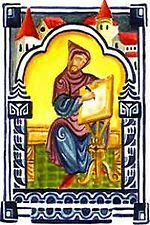 The Anglo-Saxon historian the Venerable Bede, who was familiar with the work of Dionysius Exiguus, used Anno Domini dating in his Ecclesiastical History of the English People, finished in 731. On the continent of Europe, Anno Domini was introduced as the dating of choice during the time of the Emperor Charlemagne. His successors popularized the usage of the epoch and it spread throughout the Carolingian Empire and it is this that ultimately promoted the use of this system of dating. The usage of AD gradually became more common in Roman Catholic countries from the 11th to the 14th centuries. The Gregorian Calendar was formally introduced by Pope Gregory XIII, after who it was named, by a decree, on 24 February 1582. It replaced what was previously called the Julian calendar. The reformed calendar was adopted later that year by a handful of countries, with other countries adopting it over the following centuries (England didn’t adopt it for example until 1752 … see below). The motivation for the Gregorian reform was that the Julian calendar assumes that the time between vernal equinoxes is 365.25 days, when in fact it is presently almost exactly 11 minutes shorter. The error between these values accumulated at the rate of about three days every four centuries, resulting in the equinox occurring on March 11 (an accumulated error of about 10 days) and moving steadily earlier in the Julian calendar at the time of the Gregorian reform. Since the Spring equinox was tied to the celebration of Easter, the Roman Catholic Church considered that this steady movement in the date of the equinox was undesirable. The authors of the Hebrew Bible like to give the often great age of patriarchs in Genesis; later books in the Bible assign periods to historical events, such as the time of slavery in Egypt. From these hints Hebrew scholars in ancient times devoted much energy to trying to work out exactly when the world was created (the moment at which the Bible begins). Eventually a consensus emerged which is still used in Jewish chronology. The creation is said to take place in a year corresponding to 3761 BC. The years subsequent to that date are given the prefix AM (Anno Mundi, Year of the World). AM 5760 (often written also as 5760 AM) is the same as AD 2000. In Rome attempts were made to work backwards through lists of city magistrates and through genealogies of patrician families. Eventually, in the 1st century BC, a date was agreed for the founding of the city – the equivalent of 753 BC. Dates based on this starting point are given as AUC (ab urbe condita, from the founding of the city).